Construction will begin in early July on a $13.3 million baseball and indoor track facility for student athletes at the University of Colorado Colorado Springs, university officials announced June 30. DLR Group will be the architect of record while Bryan Construction will serve as the general contractor for the facilities. The baseball field, Mountain Lion Park, and the track facility, Mountain Lion Fieldhouse, will be the first projects within the athletics zone of the UCCS north campus expansion within the University’s 2020 Master Plan. The projects will modify the plan’s original layout, with the baseball field along North Nevada Avenue near the intersection with Corporate Drive, and the indoor track facility east of the current parking lot near the intersection of Campus Heights Drive and North Nevada Avenue. The combined budget for the facility is $13.3 million, with a portion of funding from fees that students approved in the spring 2016 elections. 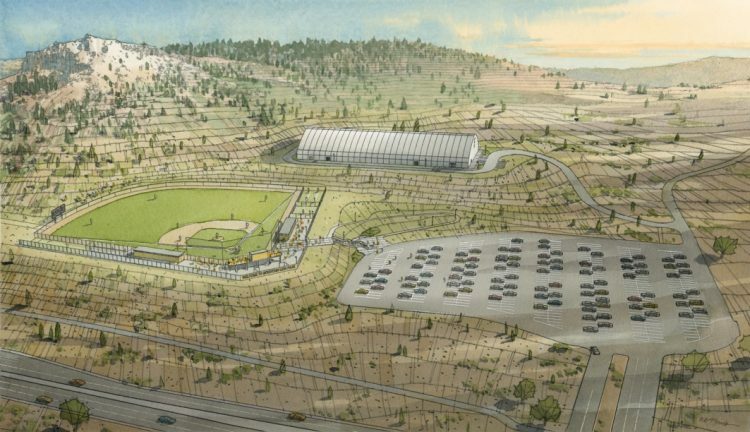 Mountain Lion Park will feature a view of Pulpit Rock for fans, with the third-base line parallel to North Nevada. The facility will be an all-turf field with lights for night games, batting cages, press box and seating. Mountain Lion Fieldhouse will be a wide-radius 200-meter, six-lane flat track with an eight-lane, 60-meter straightaway inside the oval. The complex is designed and will be built to permit continued expansion and development in the future. The high visibility and access of the facilities from Interstate 25 will allow for active community engagement for events and naming opportunities. DLR Group has worked on a variety of projects and is the lead architect for the U.S. Air Force Academy’s renovation to Falcon Stadium. The firm has worked on the renovation of the historic Los Angeles Memorial Coliseum, the design and construction of the Kansas Speedway for NASCAR-sanctioned races and the $340 million Pinnacle Bank Arena in Lincoln, Neb. Bryan Construction worked on the renovations at Security Service Field and Switchbacks Stadium in Colorado Springs, and conducted the realignment and infrastructure work for the UCCS Ent Center for the Arts. The firm has also worked with the CU Boulder Biotechnology Building, U.S. Air Force Academy’s Vandenberg Hall and Pikes Peak Community College’s downtown campus. Mountain Lion Park is projected to be ready for competition by the end of the spring 2018 season. Mountain Lion Fieldhouse will be available for practice during the 2017-18 season and for competition in the 2018-19 season.